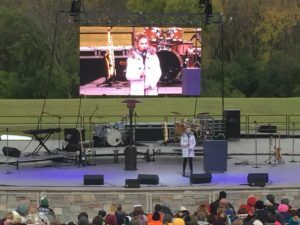 Recently America’s Got talent winner Darci Lynne came to Morehead, Minnesota’s Trollwood Bluestem Amphitheater. And what does the 13-year-old star need to make her act complete? An LED screen of course. Fire Up Creative was hired by Sound Central of Duluth, MN who was doing sound and lighting at the outdoor show. We created a 4.8mm-pixel pitch modular 45-tile wall that acted as the backdrop for the talent. Sound Central set up the truss system to the existing rigging at the amphitheater so that we could hang our screen from this. In the end Darci Lynne performed to a crowd of about 3,500 for about two hours, rotating with another band. We used a single camera for IMAG, along with the precreated animations from Darci Lynne’s show producer that added to the overall guest experience at the sold out performance. Fire Up Video offers LED video wall rentals for events all over the Midwest, including states such as Illinois, Michigan, Indiana, Tennessee, Kentucky, Ohio, Iowa, Missouri, Wisconsin, Minnesota, South Dakota, North Dakota, Kansas, Nebraska, Colorado, and more. 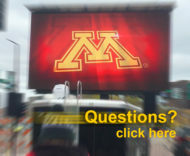 Please contact us with any questions or to rent Jumbtron screen at baum3@earthlink.net or 844-533-8848.